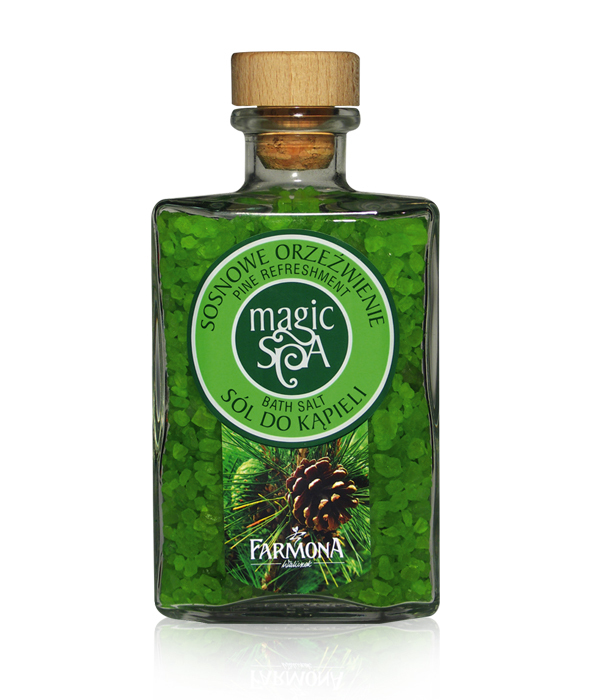 The aromatic Pine Refreshment bath salt bath salt with natural pine needles essential oil and precious microelements. Due to the fresh scent of forest conifer needles it reminds one of the moments of carefree rest, gives energy and vigor and makes one feel optimistic. It stimulates, encourages increased activity and visibly improves the mood. The bath salt cares and washes, leaving the skin velvety soft and pleasant to the touch. Put 50 g of salt under the stream of warm water. Recommended bath time: 20 min. Natural pine needles essential oil and microelements. Sodium Chloride, Sodium Lauryl Sulfate, PEG-25 PABA, Silica, Alcohol Denat., Pinus Sylvestris (Pine) Oil, Parfum (Fragrance), Limonene, CI 19140, CI 42090.